Bihar State Milk Co-operative Federation Limited (COMFED), Is Recruiting 40 Eligible Candidates, So Eligible & Interested Candidates Are Requested To Fill Up The Online Application Form Within The Last Date. Various Junior Technician Posts (Check Out The Image Below For More) →→40 Vacancies. Total Number Of Vacancies →40 Vacancies. B. 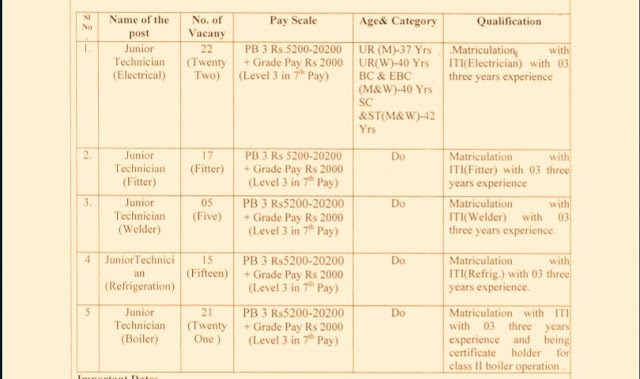 Eligible Criteria For Sudha Dairy Patna Recruitment 2019. Educational Qualifications →Check Out The Image, For This. Last Date For Online Application Form →8th Of February, 2019. Admit Card Download →For Admit Card Download Check The Link Below. Result →For More Information On Result, Admit Card Download Etc, Visit Here>Click Here. Now Apply For This Job Of COMFED Bihar. Thank You For Your Support And Do Visit Here Regularly For More Information On Job In Bihar Sarkar, COMFED And More, Till Then Stay Safe And Blessed.